Maya loves it! :"I ordered this toy few days ago, and Maya is loving it!" 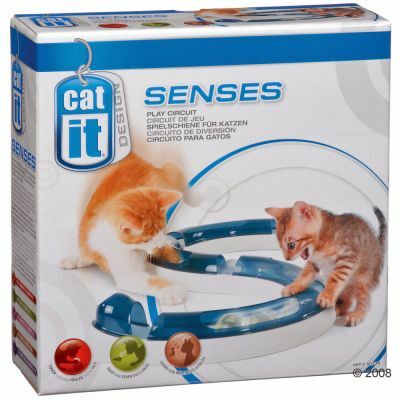 The Catit Design Senses Play Circuit is a toy which your cat will love. 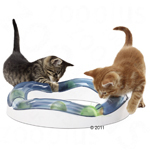 This fun game was created to stimulate all of your cat's senses. Cats have a highly developed sensory system and see and hear things that we cannot even start to imagine. They see and hear things which we cannot and they experience the world in a very different way to us. 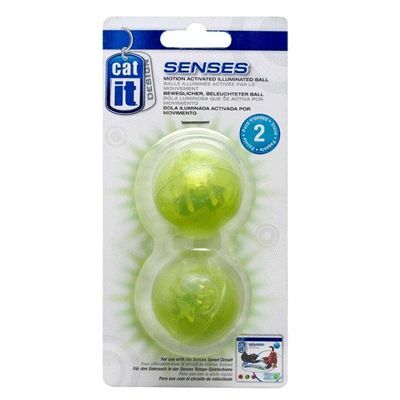 These well-developed senses are very important when hunting and the Catit Design Senses range provides your cat with activity centres and toys which allow it to indulge its extraordinary sense of sound, taste, feel and smell as well as satisfying its natural instincts. 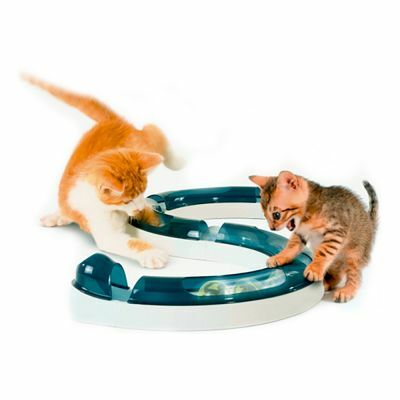 Peep hole design: There are peep holes in the track so that your cat can see, nudge and chase the ball. Grey-green ball: The ball is constructed to attract your cat's attention. Please note: this ball does not light up. Illuminating balls can be purchased separately. Circuit can be extended: Additional elements can be used to extend the track. 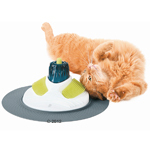 Caution: As with any other product your pet should be supervised with this toy. Please check the product regularly for any damage, and replace the toy whenever it becomes defective or when a piece of the toy goes missing to avoid any harm coming to your pet. I ordered this toy few days ago, and Maya is loving it! 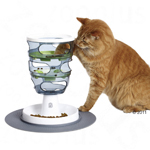 I got a freebie one of these with Royal Canin cat food. My three cats absolutely love it. They can’t leave it alone and even sleep next to it! It’s great because the cats can work it on their own, so it’s something to keep them busy when we’re out. My boys love playing with this- even after months! 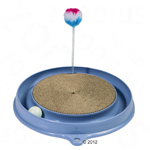 As with the previous reviews, the ball is too big for the track and it gets stuck. The concept is great and if I remove the blue covers then Sunny plays with it. The main issue then is the ball won't stay on the track so back to retrieving balls from under the sofa! Only had it a few minutes so it's a little premature to review but my one and a half year old cat loves it. The only issue is the ball is slightly too big for the circuit so it gets stuck, i don't think it detracts from his play much but i'm sure it's not supposed to be this way. Our cat Saliam is 'big boy', doesn't do a lot excercises until he got this toy. He has his meal (first things first), then straight to have fun with his toy carn't leave it alone,great fun watching too. not impressed at all. All put together and ball just gets stuck on various points of the track. Pointless. Did use another smaller ball which was fine but come on, do they not test their products before leaving factory? Neither of my young, active, cats have evinced any interest in the circuit, a few half hearted pats and then they have completely ignored it! I found it difficult to assemble as I was unable to slot the pieces together, I was just not strong enough, however my husband made it seem very easy! Probably best for kittens. BACKGROUND: We've recently adopted a very playful 2 year old cat. We knew from her fosterer and watching her that she loved the circuit the fosterer had so decided to buy one. PROBLEMS: She wouldn't play with it as the balls kept getting stuck in the 2 end pieces which was extremely disappointing. It seems to be a design flaw/manufacturing error but either way she was not impressed. SOLUTION: We removed the end pieces and made a round circuit instead. She is back to loving it again. 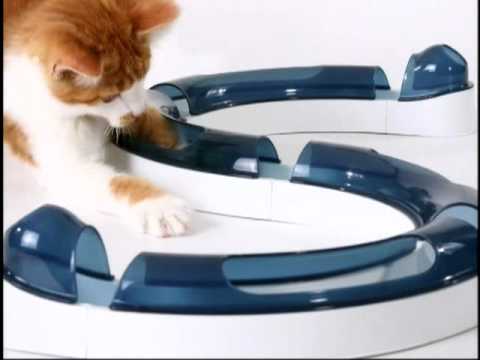 I got this to see if my newly-adopted adult cats would play with this type of toy. The minute it was assembled, they started taking it apart. They are large cats, and this is simply too flimsily built for them. I'd say kittens only. Took a few weeks but cat playing with it now. I left this out and every so I would make it light up a nod try to interest her. To start with she took to lying inside the ring I made. Then today she suddenly started playing with. Seemed to enjoy making it light up and poking her paw. In the gaps. I am glad I bought it. I will probably add to it over time. My 8wk old kitten Dempsey loves this toy, he can spend ages playing with this chasing the ball. My other kitten Dexter who is 6mths still enjoys playing with this too but we find if we put it away & bring it out in a few wks he finds a new found interest. When I got this delivered I thought, Oh dear what is this, will they play with this thing, How wrong, 5 of my 6 cats hit and chase the ball, I intend to get an extension cos it's cheaper at Zooplus. They play it everyday, it looks funny, The oldest, 16yrs just likes to watch, she has her own toys. I recommend this cat toy without a doubt. 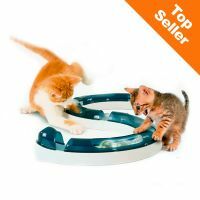 Can't wait to make it bigger for even better fun for my cats. 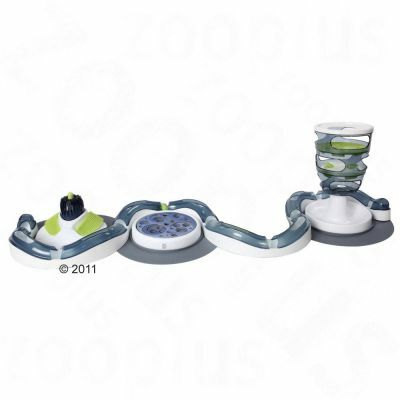 It assembles quite easily and disassembles fairly easily (once you read the instructions), the track can be extended or added to with other items in the range and seems sturdy. I’ve given it three stars based on this and the reviews here but our cat simply isn’t interested in it at all, perhaps more suited to kittens(?). Our one year Ernest loves this, trouble is he picks up the whole track. He's a polydactyl so knowing he can't pull it apart is great. Our three year old Lucille thinks it's a snake and won't go near it. Mind you her nickname is PTSD kitty. I want to have a go with the illuminated ball and maybe an extension. Living in an old house with uneven floors makes for even more fun. bought this for my cat as an upgrade from small one that he loved. he loves this toy and you can change the shape from snake to round so it keeps him occupied for ages and something new every now and then.